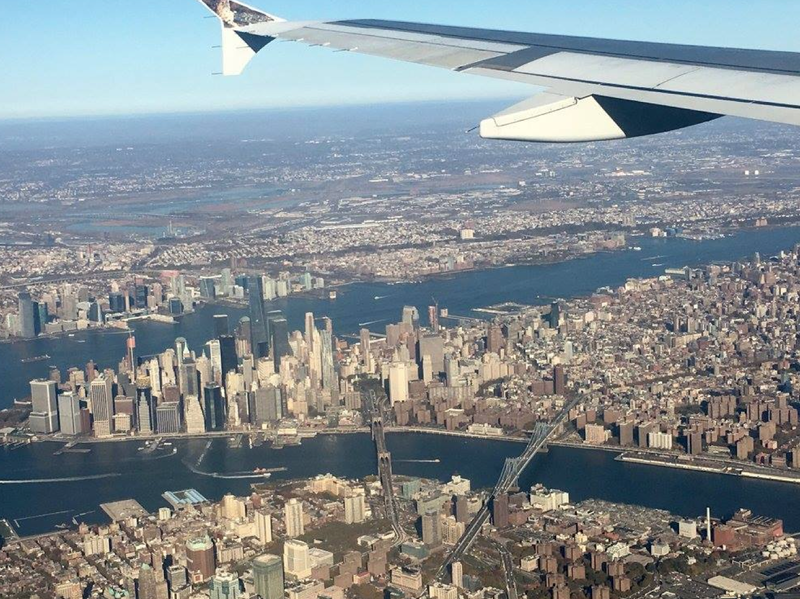 Fact: The end of August is a great time to buy airline tickets. I received an alert around that time from one of my favorite travel sites, TravelZoo, about a flash sale from Frontier Airlines—with fares as low as $15 each way! Luckily, I was online at the time and had a few minutes to spare. I’d really been wanting to head back to New York City lately. I start feeling this longing for the City after not having seen a Broadway show in a long time. 😉 If I could fly up and back in the same day cheaply, I’d get there a lot more often to see shows and friends. Anyway, that’s the deal I was hunting for . . . and I found it! For just $30 round-trip, I had scored myself a ticket to NYC! It did require an overnight stay, but luckily I had hotel points. Now, I was on a buyer’s high! I mean, come on, that’s a great deal! I clicked back on the site to see what else might be available to me. And, as you can imagine, the deals were selling out quickly! There were several other offers, but I had a few requirements. First, I needed it to be a short trip due to my schedule at the time. There weren’t a lot of gaps. And the cheapest deals were on Tuesdays and Wednesdays. So, that meant I needed to stay in my time zone, or make it a short flight, to get the biggest bang for my buck (all 30 of them). Second, it’s not like I have piles of money lying around. And NYC isn’t a cheap city. So, I needed to be able to find a place with multiple options for my hotel points, that would still be convenient to the places I wanted to go. Also, Frontier charges for things that other airlines don’t, so if you aren’t careful, costs can easily go up. Finally, I didn’t want to rent a car, so I needed to be able to walk or use public transportation or the like. Washington D.C. fit the bill. And I’ve been there twice, but had been wanting to go back. Plus, lots of free museums! So, I snagged that ticket too. I couldn’t believe it! Landed around 9:00 a.m. Yes, that meant getting up crazy early! Took NYC Airporter into the City. Great service! Checked in early to Seton Hotel. They were super nice to let me check in so early. Walked to Bryant Park, where they were having a Christmas Village of shops and an ice skating rink. While there, ran into someone I knew from Atlanta, the owner of Smart Glass Jewelry, and chatted for a bit. Walked through Times Square and down to Herald Square where a lady stopped me and told me that I was a complete doppelganger for her friend. Met my friend, Jordan, for lunch at this super yummy Korean place she loves. Went to the 9/11 Memorial and Museum. It’s incredible. Please go. Met my old roommate, April, to try and get lottery tickets to Hamilton, but didn’t win. That show is on my list! Dinner at Ca Va just a couple blocks way. Delicious. Saw the super funny show, Something Rotten, and chatted with the two older ladies who were in our box. Sweethearts. Snagged a tea from Coffee Bean and Tea Leaf in Times Square, my favorite coffee chain. Back to the hotel for a few hours of sleep. Took NYC Airporter back to the airport. Flew out at around 9:30 a.m! Uber Pooled to my hotel, the Grand Hyatt. Another really wonderful hotel allowing me to check in early. Trekked to the MLK Memorial since I didn’t have a lot of daylight left. Quite beautiful and inspiring. It was #1 on my list for this trip. Headed over to the reflecting pool since the two other times I’ve been, it has been drained. Third time’s a charm! And then, once you’re on the National Mall, it’s just so easy to hit every other memorial and monument in that area, even though I’ve seen most of them before. Might as well get another pic! Walked over to the ellipsis to see the White House as the sun was setting. Spent time at the National Portrait Gallery. I’ve never been here, and it was just ok. Not my first choice, but the only one open till 7:00 p.m. Seriously, all the museums close way too early! I would’ve enjoyed the guided tour, I think, but they didn’t have one in the evening. So, I’m glad I checked it off my DC museums list, but I wouldn’t do it again like many of the others. Met my friend, Liz, for dinner at one of her favorite places, Central. Really good. Back to the hotel to rest my feet and sleep. Unknowingly, I had walked 11 miles! And boy, did every part of my feet and legs feel it. Most of my morning the next day was spent at Ford’s Theatre. I’d tried to go on my last trip, but it was under renovations. It’s a really great museum, and one day, I’d also love to see a show there. Final stop was the Newseum. I hadn’t even heard of it until my friend Becca suggested it when she found out I was going. It’s incredible! I wish I’d had more time, but will definitely go back. Luckily, I got to go on the guided tour which made getting through it and understanding it much easier in a short amount of time. Then it was back to the airport via Uber around 2:00 p.m.
Two very quick, but very fun trips! You can see more photos on my Instagram here. After these two experiences, I will definitely do this again next year! Categories: Fun, Learn, Live | Tags: 9/11 memorial and museum, coffee bean and tea leaf, ford's theatre, frontier airlines, grand hyatt, mlk memorial, museums, national mall, national portrait gallery, new york city, newseum, nyc, nyc airporter, seton hotel, travel, travelzoo, uber, washington dc | Permalink.